This must be the summer to go camping. In response to questions I've gotten regarding my camp post (here), I'm including this little tip -how to transport your eggs. 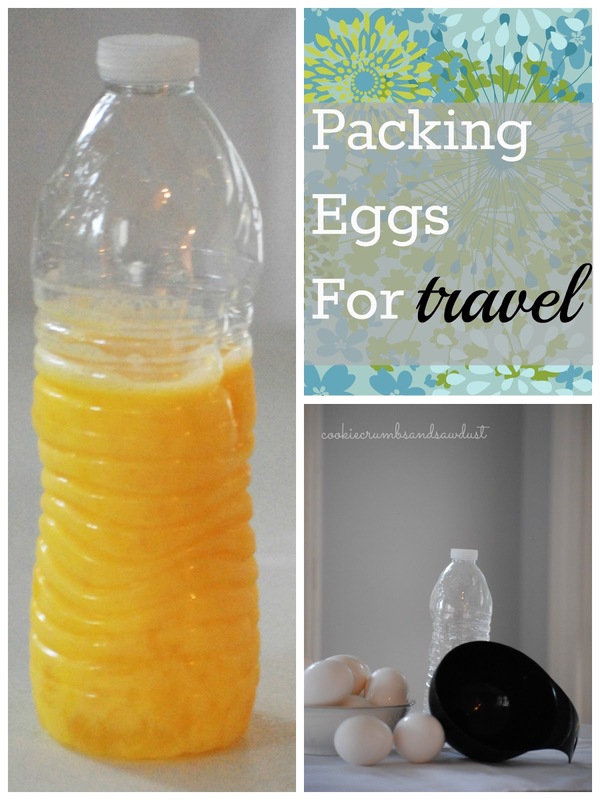 This is my favorite way to pack for recipes that call for beaten eggs. Just lightly beat them ahead of time at home, then pack them in a recyclable water bottle using a kitchen funnel. A 16 oz water bottle will hold approximately 8-9 extra large eggs. If camping for several days, just pack in separate water bottles and label by day or dish. This eliminates any measuring on site. If you need whole eggs, I would transport them in a sealed sturdy container. I know this is just such a simple tip, but when camping with kids, anything I can do ahead of time makes our trip easier and is worth doing. Plus, it eliminates the need to pack a separate bowl and whisk and leaves less dishes to wash. If you are looking for helpful information about camping info, this page is for you. Awesome! This is very timely as I just bought some materials from Toy Hauler Parts that can help improve our RV kitchen. 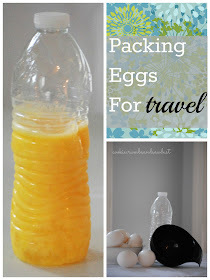 It never crossed my mind to pack eggs this way during RV travel. Truly genius! This is for beaten eggs...but could we also use a wider mouth (to accommodate the yolk) to take whole eggs? How long can they stay fresh/safe? Have seen bottles used to seperate yikes from whites! Squeeze bottle and slurp up the yoke! How long can the eggs keep like this? Does anyone know? beat in either 1/8 teaspoon salt or 1 1/2 teaspoons sugar or corn syrup per 1/4 cup of egg yolks (about 4 yolks). Label the container with the number of yolks, the date, and whether you’ve added salt (for main dishes) or sweetener (for baking or desserts). Freeze. According to Eggland's website you can do this if you freeze them. Check out their website.